Tanzania made its position on the Iraq war clear before it began. President Mkapa announced that the government and people of Tanzania were opposed to the war and Prime Minister Frederick Sumaye told parliament on February 14 that military supremacy might win the war on the battlefield but it would not bring peace or win hearts. Tanzania also could suffer economically if another war was imposed on Iraq. It was difficult to hear a dissenting voice and Tanzanians appear to have been united in opposition to the war. The East African, in an angry article under the heading ‘Humiliated, Helpless, we are all Iraqis Today’ reported the views of a news vendor in Dar es Salaam: “American heavyweight Mike Tyson slugs it out with Tanzanian featherweight Rashidi Matumla!” The article went on: ‘The unequal Anglo-American war on little Iraq is termed “War in Iraq” as if there were simply civil strife going on there, not an invasion by the world’s superpowers of a Third World poor country. There is nothing on the global news networks, BBC or CNN, to assert this fact -that the war is not being fought between equals in terms of weapons, resources and technology. 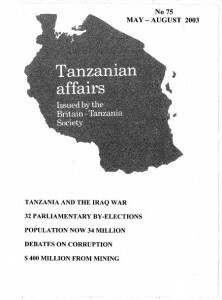 If any were in doubt about the Tanzanian view they had only to read the Swahili press which rivaled British tabloids in the extremism of its news coverage. By April 10th however, the tone had changed. According to The Swahili paper Rai, in a bid to counter terrorism, the American Federal Bureau of Investigations will establish an institute for training Police investigators on how to combat terrorism. Construction of the institute, which will also cater for neighbouring countries, is to commence in July this year near Dodoma. The Capital Development Authority (CDA) was said to have allocated 127 hectares for the project. The Senior Assistant Commissioner of Police was quoted as confirming the reports. There will be significant by-elections on May 18 for 15 seats in the Tanzanian National Assembly mostly from Pemba Island in Zanzibar (but including four mainland seats) and another 17 seats are being contested in the Zanzibar House of Representatives. All but one of the seats in Pemba were previously held by Tanzania’s main opposition party, the Civic United Front (CUF). The previous MP’s had been expelled from parliament because of a boycott they had conducted in protest against what they consider to have been rigged elections in 2000. The 17th seat became vacant when Tanzanian Vice-President Dr Shein had to give up his seat on taking up his new appointment. The election results will not make any dent in the dominant position of the ruling Chama cha Mapinduzi (CCM) party in Tanzania but they should provide some indication, if the elections are free and fair, as to the correctness or otherwise of CUF’s long­standing claim that it is the majority party in Zanzibar. For this reason the by-elections are being fought with great vigour by both sides. The CCM party claimed that many people living in the main island of Zanzibar were going to Pemba to register as voters for the by­elections and accused CUF of being behind the move. As this issue of Tanzanian Affairs went to press there was good news. Both the CCM Treasurer and the CUF Director of Planning reported a peaceful atmosphere during the voter registration exercise and the CUF Director described the behaviour of the police as commendable. But, according to Majira, registration was said to be proceeding slowly. Also, according to the same paper ‘big shots’ from the CCM had expressed uncertainty on the outcome of the by-elections. One was quoted as saying a CCM loss in Pemba would not be a big issue. If the Party lost it would concede defeat. In a surprise result CCM has lost a ward in local elections for Musoma Town Council to the CUF candidate by a margin of six votes. Local CCM members demanded the resignation of their district chairman and secretary blaming them for CCM’s failure to win the seat. Eleven opposition political parties drew up a provisional agreement at the beginning of February to field one presidential candidate in the 2005 elections. They also agreed in principle to divide parliamentary constituencies among themselves. Augustine Mrema’s Tanzania Labour Party however refused to join the alliance because he said that Tanzanians were not yet ripe to vote for a single opposition candidate as had happened in Kenya last year. Tendwa said that Jidulamabambasi had originally presented documentary evidence, which he had accepted, to justifY his claims that the UDP Central Committee which had met on 6 July last year had decided to dismiss Cheyo. Later, Cheyo submitted the original minutes of what actually transpired at the meeting written by the Deputy Secretary General, who was a regular minutes writer, in his own handwriting. When he was called to Tendwa’s office to identify the minutes early this year, he denied his own handwriting. In order to settle the dispute, the Registrar decided to present the original copy of the disputed handwriting to the Identification Bureau of the Criminal Investigations Department for technical verification which indicated that there had been ‘significant similar characteristics.’ With the documentary evidence presented at his office and technical results from the CID, Tendwa said his office had reviewed its former decision and reinstated Cheyo. As this issue of TA went to press Jidulamabambasi was said to be wanting to take the Registrar to court. Ms Davey paid tribute, firstly, to the British Council for what she described as its ‘incredibly good work in increasing the number of women in effective leadership positions and also, to Dr Elly Macha, the Britain-Tanzania Society-supported blind Tanzanian student who recently completed her PhD at Leeds University. During recent weeks, if one is to judge by the prominence given to the subject in the Tanzanian parliament and media, corruption has come a close second to Iraq, in terms of public interest. Two people in particular have made the allegations which have stimulated the debate and have gained a great deal of publicity in the process. They are the former Head of Intelligence and present CCM MP for Makete, who is also a member of the ruling party’s National Executive Committee, Dr Hassy Kitine who has made wide-ranging allegations to the effect that many CCM and government leaders are corrupt; and, on February 18, long-term activist/politician and Chairman of the very small Democratic Party, the Rev. Christopher Ntikila who directed his attention to alleged corruption by Prime Minister Frederick Sumaye. But many others soon joined in the fray. The former Chairman of the Anti-Corruption Commission, which had produced a much praised report to President Mkapa on corruption, Judge Joseph Warioba, told journalists that he agreed with Dr Kitine that some leaders in the country were corrupt. Dr Kitine had been right in expressing his view about what was amiss in the country. Transparency International the corruption watchdog calculated in its 2002 ‘Corruption Perception Index’ that Tanzania was the 12th most corrupt country in the world and the 7th most corrupt in Africa. The March issue of ‘Africa Today,’ in an article headed ‘In the Grip of Corruption’ noted that in Tanzania there had recently been a notable shift from the culture of silence inside Tanzania’s ruling circles and that Kitine’s allegations had triggered a ‘somewhat sizzling debate amongst the public’. The media were said to be ‘beaming a searchlight on corruption’. In its editorial on 23rd January the Guardian stated that the remarks made by Dr Kitine had ‘shaken the entire country and the Government quite a lot.’ Otherwise, it wrote, how could the latter’s reaction be explained? The Government, through Minister of State in the President’s Office, Wilson Massilingi, had reacted quickly by saying that Kitine’s allegations should have been channeled through the Prevention of Corruption Bureau (PCB) and not made to the media. Why did the government reveal its position so quickly, the editorial asked. Why were the public not allowed to express their views first? Dr Kitine, supported later by Musoma MP Nimrod Mkono, had injected a breath of fresh air into democratic discourse in Tanzania. It was a healthy debate and a sign of maturity, the Guardian wrote. Under the front page headline ‘MP Tired of endless corruption literature’ the Guardian (February 22) quoted the MP for Bukoba Urban as complaining, at a Workshop for 200 MP’s: “Every year we hear the same things …. I can safely predict that even next year, we will be bombarded with similar lectures on the corruption issue,” he said. Well known CCM MP Gertrude Mongela, although critical of Kitine, said that the situation would not have reached its current stage if the Government had properly implemented recommendations contained in the Warioba report on corruption. Mwananchi quoted retired High Court Judge Raymond Mwaikasu as saying that corrupt leaders were known to the PCB but it was unable to take action because it was responsible to the President’s Office, which often ‘hindered it from naming or making decisions on corrupt leaders’. He called upon the PCB to be given freedom to work independently. The Kitine case created a sensation but soon became quagmired in allegation and counter-allegation, which led to a situation of considerable confusion. Dr Kitine had originally been in trouble over allegations that his wife had been wrongly paid fees by the Government for hospital treatment she had received in Canada in 1997/98. Dr Kitine had subsequently resigned form his position as Head of Security. More recently Parliament’s Accounts Committee had initially declared Mrs Kitine innocent but a month later, according to the Sunday Observer (February 23) discretely changed its mind. Mbulu MP Philip Marmo said that the government’s demand for proof about corruption was to question the obvious. Marmo suggested that there was no need to demand evidence and proof from Dr. Kitine, because what he had said was known by Tanzanian society. MP’s were divided on the matter although many were critical of Kitine and said that he should have addressed his comments to the party leadership or to the Prevention of Corruption Bureau. CCM Youth Wing Mobilization Secretary and Nkenge MP, Deodorun Kamala, said that if the Government was serious about the war against corruption, there was a need to change the judicial system in the country. He said that it was high time that the burden of proving innocence or guilt of those accused of corruption should placed on the accused as it was difficult to prove corruption allegations in the courts. Between the Government and normal citizens, who was in better position to quickly get evidence on corruption allegations?” Kamala asked. This prompted a reaction from Attorney General Andrew Chenge, who said that the legal system that governed civil disobedience in the country was based on the Commonwealth system that put the burden of proof on the prosecution side, as opposed to the continental system followed by many European countries, that put the burden of proof on the accused. Minister for Justice and Constitutional Affairs, Harith Bakari Mwapachu, said corruption cases would continue to be resolved through the current system as the government had no plans to establish a specific organ to deal with such cases. Meanwhile, the Rev. Mtikila went further and listed properties he alleged were owned by Prime Minister Sumaye or his wife or his allies. The list included houses in Morogoro, Arusha and Dar es Salaam, farms in the Coast, Dodoma Morogoro and Arusha regions, factories and an aeroplane. Within days several leaders and others made statements contradicting the allegations. Home Affairs Minister Mapuri made it clear that the CCM party would not discuss corruption allegations against the Prime Minister because they lacked credible evidence. However, on 10th April the Dar es Salaam ‘Family Mirror’ reported that the PCB had taken up the allegations against the Prime Minister to determine whether he had misused public office to amass wealth. PCB Director-General Anatory Kamazima was quoted as saying that the PCB was collecting evidence on Sumaye’s registered properties. The Home Affairs Minister was quoted in several newspapers as saying that CCM would debate and investigate allegations facing the Prime Minister if it received the allegations from official and credible sources. He said that so far only ‘blah blah’ had been heard and no evidence of corruption had been provided. He said that the Prime Minister, like any other leader, had a right to own property including farms. As this issue of TA went to press the Sunday Observer quoted the Prime Minister as saying that he was not corrupt and was considering the possibility of suing those making the allegations. President Mkapa entered the debate several times. He was quoted in Mtanzania in January as saying that corrupt practices were rampant in the construction industry and that efforts to fight it had proved futile. He urged engineers to rescue their profession by side lining those who condoned corrupt practices. As this issue of TA went to press Majira reported that President Mkapa had acknowledged receipt of an anonymous letter listing corrupt ministers, deputy ministers, directors and companies that had solicited favours from public officials in exchange for bribes. The President said that Tanzanians were not bold enough to name the corrupt in their midst and that many were jealous when they saw colleagues with new cars and houses. However, on February 9 the Sunday Observer had written as follows: ‘The marauding scourge of corruption devastating the economies of poor countries had shown a downward trend in Tanzania since last year when government started implementing its ‘Anti-corruption Strategy and Action Plan.’ Closing a one-day conference on ‘Good Governance’ in Dar es Salaam Chief Secretary, Marten Lumbanga, said it was not true that the scourge was increasing. The corruption index in Tanzania had fallen from 81 points to 71, compared with the rising trend (above 70) in some neighbouring countries. “These are not my figures” he said “They are published by ‘Transparency International’ He said the fall in the corruption index showed that the anti-corruption programme was becoming effective. “We are certainly not complacent about this initial success. In fact we are energised to continue fighting the scourge tooth and nail” he said. (The Financial Times (March 25) reported that a draft corruption Bill is now being prepared for presentation to the British Parliament under which business people who use backhanders to help contracts progress in foreign countries could face up to seven years in jail. Ever since the time of President Nyerere, Tanzania has been pressing Britain to make this end of the corruption cycle a crime -Editor}. STOP PRESS. The verdict was given on April 18 in the long standing corruption case against former leaders of the Ministry of Public Works. Minister Nalaila Kiula, the Roads Director and a Chief Engineer have been found not guilty. The Principal Secretary at the time has been sent to jail for three years. According to Dar Leo the Government may appeal against the three not guilty verdicts and the Principal Secretary will definitely appeal against his sentence. The 2002 census has revealed that Tanzania’s population has now reached 34,568,609 of whom 984,531 are in Zanzibar. Growth rates averaged 2.9% on the mainland (4.8% in Kigoma, where there are many refugees, compared with 1.4% in Lindi) and 3.1 % in Zanzibar. Average numbers per family were 4.9 compared with 5.3 recorded in the 1998 census. Population densities were 38 per sq km on the mainland and 398 per sq km in Zanzibar. Dar es Salaam recorded 2,497,000 people -Daily Mail. Most observers of the religious scene in Tanzania agree that relations between Muslims and followers of other religions are generally good. But, perhaps reflecting conflicts with a religious element in other parts of the world, Tanzanian Muslims are showing increasing signs of unhappiness both within their own ranks and against Christians in the belief that Christians are better treated in Tanzania. There have been several minor incidents during recent weeks: On February 26 the Chief Sheikh of the Parley of Clerics of Zanzibar blamed the Zanzibar government and in particular the newly-created Office of the Mufti for denying Muslims their constitutional right of freedom of worship. The Chief Sheikh said that the two recent incidents in which the police had used force against Muslims peacefully marching, one during the Eid el Hajj and the other on February 21, provided proof beyond doubt that the Government had created the Mufti’s office to intimidate Muslims. “We can’t see any point in having this Mufti office” he said. The constitution gave people the right to gather and preach. Meanwhile Zanzibar Attorney-General Hassan Iddi Pandu Hassan reminded people that The Mufti (Constitution and Powers) Act of 2001, which was enacted to control foreign religious groups intending to disrupt peace and tranquility, must be followed to the letter. He said that members of religious groups from Pakistan and Afghanistan had been to Zanzibar and were sleeping in mosques. This could adversely affect the security of the nation. The Guardian reported on February 18 that some people had been injured after being shot by members of the Field Force unit in Zanzibar; several people had broken into bars and wine shops and burnt government vehicles. 20 people later appeared in court over the disturbances and the loss of property. On March 14 the Guardian reported that the Court of Appeal had quashed the conviction and set aside a sentence of 18 months’ imprisonment on Hamis Dibagula for uttering words with the intent to wound religious feelings at a religious meeting. In a 25­page judgment, the judges pointed out that the prosecution had to prove that the appellant had a deliberate intention to wound the religious feelings of those within hearing range. When the appellant told his audience that ‘Jesus Christ was not the Son of God’ he was doing no more than preaching his religion. They quoted several Surahs (Chapters) from the Koran, one of which said that ‘Christ the Son of Mary’ was no more than a messenger. The question was a purely religious one and therefore could not fall for determination by a court of law. The judges concluded by saying that religious intolerance had launched many wars and caused endless streams of blood. Religious intolerance was a device which must not be permitted to find a place in the hearts of our people. On March 15 some hundreds of Muslims demonstrated in Dar es Salaam against the proposed visit to Tanzanian tourist centres and game parks by a group of 100 American homosexuals. The Muslims chanted insults at the Government, BAKWATA and the ruling CCM party and threatened violence against motorists and bystanders. At a symposium shortly afterwards to commemorate the Moslem New Year 1424 Al Hijiriyyah in Dar es Salaam, Moslem scholars, teachers, students and Imams began to make plans on the best way to combat homosexuality in Tanzania. According to An-Nuur, a new Swahili newspaper in Zanzibar, tourist hotels in Arusha had been warned not to accommodate the gays from America. The Sunday Observer (March 2) quoted a prominent Tanzanian clergyman as announcing that he also would organise a protest march over this planned visit. The paper’s editorial stated that homosexuality was a taboo practice in Tanzania and that whoever regarded homosexuality as un-Tanzanian could do so without fear of contradiction. ‘It is disturbing however’, the article went on ‘that no concerted battle is being waged against homosexuals.’ The Zanzibar Government, but not the Union Government, outlawed the proposed tour, which was cancelled before it began. Zanzibar Industries, Commerce and Tourism Minister Mohamed Aboud told Majira that the Government would not allow the gays to tour Zanzibar because they were not ‘normal’ people. Nipashe quoted the Full Gospel Bible Fellowship Bishop Zakaria Kakobe as threatening to organise a massive demonstration against the proposed tour. Pope John Paul’s representative in Tanzania, Michae1 Fitzgera1d, has called upon people not to regard every Muslim as a terrorist and instead to take steps to harmonise relations between Muslims and Christians. He was talking to the head of the Muslim Council, BAKWATA, Chief Sheikh Issa bin Shabaan Simba. Fourteen Sheikhs, Imams and religious teachers underwent voluntary HIV testing early in the year. They were praised by health officials for ‘leading by example’. The leaders said that they had taken the tests in the hope that their followers would follow suit. However, they added that they would never condone the use of condoms. The Government has published the detailed report of the Presidential Probe Commission on the killing of demonstrators by police in Zanzibar on 26th January and 27, 2001. CUF chairman Ibrahim Lipumba described the report as shallow and a government whitewash. Those who were involved in the killings would have to account for their offences,” he said. The source of the killings had been CCM’s resolve to cling to power at any cost even when it had been defeated. The Commission was chaired by Brigadier-General Hashim Mbita. Lipumba said that he had requested President Mkapa to include independent members in the Commission but none ofthe names he had suggested had been found acceptable. The British Sunday Times (29th December, 2002) and the BBC reported that the British Foreign office had updated its tourist travel advice last Christmas eve: ‘We believe that Tanzania, including Zanzibar and Pemba islands, is one of a number of countries in East Africa where there may be an increased terrorist threat. British nationals should be vigilant in hotels, restaurants, bars and nightclubs.’ As a result several hotels reported booking cancellations although most tourists already in the Isles did not show any inclination to cancel their holidays. Home Affairs Minister Omar Mapuri responded by saying that the Government had put in place security arrangements that would make it impossible for terrorists to operate easily in the country. He called upon tourists to feel free to visit the country’s attractions. It is now possible to obtain visas for Zanzibar on arrival in the country. British High Commissioner Richard Clarke was quoted in the press on January 25 as saying that Britain had never at any time ordered its nationals to cancel their plans to visit Zanzibar; neither had it issued an order to its nationals already there to leave the country. He had come to the conclusion that the Isles were peaceful and safe. The leader of a Sussex Chamber of Commerce trade mission to Tanzania told the ‘Business Times’ that trading opportunities in the country were increasing following notable improvements in macro economic fundamentals. He cited the low inflation rate, and good GDP growth rate. The ‘East African’ (March 24) reported that Tanzania’s foreign exchange reserves had risen to $1,528 million as of December 2002, equivalent to 18 months of imports and the highest level of reserves achieved in the past 20 years. This was attributed to policy guidelines that required the Bank of Tanzania to maintain adequate reserves, the stability of prices, increased flows of donor support and debt relief. The Tanzania Investment Centre at last year registered the largest number of new investors in the country since the department was established in 1997. 320 investors were registered, compared with 239 in the second best year, 1998. Most investment was in the manufacturing centre, followed by tourism. 80% of the investors were reported to be doing well. Last year Tanzania’s mining industry earned about $400 million making it the second major foreign-exchange earner after tourism which brought in $725 million. It is predicted that within the next two years gold will be Tanzania’s main export -The East Africa. President Mkapa said on 28th February that Tanzanians must accept the stark realities of globalisation and work hard to create a national economy that could fully benefit from that system. In his monthly national radio and TV address to the nation he criticised Tanzanians for being engaged in a futile debate on who owned what in the economy. “Unfortunately, most of our debates don’t show that we understand current global economic trends. What we hear on political forums is about calls for indigenous ownership of the economy and not how to create a patriotic national economy ….. Grants and loans can never be a substitute for hard work” he said referring to the heavy dependency of the country on foreign assistance. On February 19 the Government announced that it had leased (for ten years) management of the Dar es Salaam Water Authority (DA WASA) to ‘City Water Services Ltd’ owned jointly by Biwater ofthe UK and Gauff Inenieure ofGermany. The company, together with the World Bank, African Development Bank and European Investment Bank will invest $160 million -Guardian. The Bank of Tanzania has issued new 500/-, 1,000/-, 2,000/-, 5,000/-and 10,000/-notes. There was much surprise when, within a month, forged new notes appeared on the streets. Since Kilimanjaro Airport was privatized in 1999 the number of airlines using it has increased from two to forty. The Tanzanian/European company in charge has just invested a further Shs 3.2 billion in restructuring and modernization -Sunday Observer. The Government’s firm decision to privatize the National Microfinance Bank (established after the sale of the National Bank of Commerce in 1997) has attracted a lot of criticism not least from its own Board of Directors. Eventually, on March 1 the Government dissolved the Board. In February, such had been the strength of the opposition in parliament, that the Bill allowing for the privatisation had been withdrawn. It is to be presented again with a larger Tanzanian component in the shareholding. The Bill had proposed 51% shares to be held by a strategic investor, 30% by the Government and the rest by private local and other investors -Guardian. The five-star Dar es Salaam Holiday Inn has won the ‘Six Continents Hotels’ Best Newcomer of the Year Award’, making it the best new Six Continents hotel in the world for the year 2002. There are some 3,000 hotels in the group worldwide. The Tanzania Cigarette Company (TeC) said on March 31 that it had produced 4 billion cigarettes last year and had about 95% of the domestic market in the country. The Tanzania cigarette industry generates more added value for locally produced raw materials than any other industry in the country and employs 700 people. TCC has a network of 680 wholesalers and 40,000 retailers. The Business Times (March 10) reported that, at long last, a buyer had been found for what was once Tanzania’s biggest and most prestigious hospitality establishment, the Kilimanjaro Hotel. It has been sold to ABS Holdings Ltd, a group of companies based in the United Arab Emirates, for $33 million after languishing for more than 10 years with no takers acceptable to the Government. The Kilimanjaro is to be refurbished to five-star standard. As the pyrethrum planting season came to a close in April it was revealed that 1,500 tons were still in store in Mbeya and Iringa because no market had been found for the crop. Some experts believed that this was because of the poor quality compared with that of its principal competitors, Kenya and Tasmania. Kenyan farmers were able to sell a kilogram for between Shs 900 and 1,200 per kilo while Tanzanian farmers were selling at between Shs 350 and 500 per kilo. However, there were better prospects for the future because the Uyole Agricultural Research Centre had come up with a superb pyrethrum clone which could transform the prospects for the crop -Guardian. Tanzania remains a very attractive destination for foreign aid and Zanzibar is no longer being subjected to donor boycotts. The Danish government has restored its humanitarian aid to Zanzibar with the grant of Shillings 746 million for medicines and medical equipment. -Sweden -$50 million to support Tanzania’s 2003-06 Primary Education Development Plan. A joint statement by the governments said this had been the largest-ever sum approved by SIDA, Sweden’s international cooperation and development arm, to any partner country in the field of education. -China -$1.2 million to ease transport problems in Zanzibar. -Germany $86 million, mainly on water and sanitation projects for 2003-2004 making Tanzania the second largest recipient of German aid in sub-Saharan Africa. -Japan $2.9 million in debt relief. -The EU -€38 million for the agricultural sector. Tanzania’s flag carrier, Air Tanzania Corporation Limited (ATCL), was launched on April 1st. Chairman, Ali Mafuruki said that the former Air Tanzania Corporation, which was recently acquired by South African Airways, would have new routes. “To the West we are looking at Lagos and other points in West Africa and to the North, Europe beckons with London as the first planned destination” he said. However, new routes would only be opened when they proved to have commercial value. In phase one, A TCL would increase its flights to Johannesburg, Nairobi and Entebbe. In the coming weeks the company would embark on the first stages of developing Dar es Salaam as a hub. “When the troubled skies in the Gulf clear, we shall launch our services to Dubai and Muscat. The company would introduce an additional three Boeing 737’s and two De Havilland Dash-8 aircraft. The government owns 51% of the ATCL -Sunday Observer. According to the Dar es Salaam Mirror (March 20) dynamite fishing, once rife in the Tanga region, has in recent years witnessed a decline, thanks to concerted efforts by the Tanga Coastal Zone Development Programme (TCZDP), Government and the community at large. Brief extracts from the article: ‘The TCZDP was launched in 1994 with the principal objective of ensuring the sustainability of marine resources in the districts of Tanga, Pangani and Muheza … .In the early 1990s, there was increased pressure on fisheries resources leading to a decrease in fish supply. The major cause was dynamite fishing which was responsible for the destruction of an estimated 12% of Tanga region’s 1996 reefs. This, coupled with intense fishing resulted in diminished catches in 90% of the reefs. Under the Programme, joint patrols were established to enforce fisheries regulations and a ban was imposed against dynamite fishing. The number of recorded blasts in Tanga region had dropped to less than five a month from over 180 a month in 1994. Other measures taken included closure of certain reefs for fish stock replenishment and reef recovery. Also, fish aggregating devices and mariculture were tested as potential alternatives to inshore fisheries. The East African reported on March 17 that Tanzania was planning new measures against pirate fishing boats along its coastal areas and its 200km ‘Economic Exclusive Zone’. The Government was proposing to establish in July a ‘Deep Sea Fishing Authority’ (DSFA), which would have powers to arrest pirate boats. Minister for Natural Resources and Tourism Mrs Zakia Meghji, was quoted as estimating that over 70 illegal fishing vessels were operating in Tanzania’s waters and were targeting tuna, kingfish, lobsters and prawns. Both Tanzania and Zanzibar have licensed vessels to fish their waters but trawlers from as far afield as Japan and China are said to be illegally fishing. French naval forces operating in the Southern Indian Ocean Zone pledged to help arrest illegal fishing vessels along Tanzania’s coastline and were reported to have chased away 80 illegal trawlers over the past year. The JOHANNESBURG STAR reported recently that a Tanzanian had surprised South African Police Service narcotics detectives when, arriving from Dubai, he relieved himself of 140 ‘bullets’ of cocaine worth about £20,000, the largest number of bullets ever found on one individual coming into South Africa. Apparently the man had been preparing months in advance -grapes, ice-cubes and even sausages had been shovelled down his throat to get his insides ready. If one of the condoms had ruptured the man would have died of a severe overdose of the drug. He was reported to be quite relieved still to be alive. The Western Australia CAMBRIDGE POST (March 8) described how a Tanzanian born with no arms or shoulder joints and an Australian who has no legs and travelled on stumps with special spiked fittings recently climbed Kilimanjaro. They took the Umbwe route, used normally by experienced climbers. Led by Brendon Goss, an Australian working at the Resolute Gold Mining Group in Nzega, the young men were aiming to raise awareness of disablement in Tanzania and helping to set up the ‘Hamisi Lugonda Centre’ for people with disabilities. The climb -up rocks, cliffs and over glaciers (at night) -took 17 days (climbers normally take about seven days) but the skidding, sliding trip down took only two and half days (Thank you Douglas Gledhill for sending this item -Editor). Under the heading ‘Grape Expectations’ the BBC’s FOCUS ON AFRICA (April-June) described how a Tanzanian wine company -the ‘Tanganyika Vineyards Company’ -was battling to grab a share of the local market as many people in Tanzania preferred imported wines. Extracts from the article: ‘In the early 1980’s Tanzania’s socialist government took a serious interest in the winemaking business and, at the height of production, was making around 2 million litres a year. The business then fell into decline and the few wineries that were in existence closed down ….. The Vineyards Companies Chairman, Moses Kagya, was quoted as saying “We are a young company and still have a lot to learn about producing wine. After five years in the business I can say that our wines are very drinkable, but there is still a lot of room for improvement…. ” Kagya is a self-confessed wine lover and, unlike the majority of Tanzanians, grew up in a family where wine was frequently served at dinner. Around $0.5 million has been invested in the business in largely state-of-the-art machinery which would not look out of place even in wineries in Australia, New Zealand or the USA. At present the company is using two grape varieties to make three types of wine -Makatupura Red, Chenin Blanc and Rose’. Its capacity is around 200,000 litres a year. …. Dodoma is one of the few places in the wine-making world where two grape harvests are possible each year. However, the industry faces many obstacles: the vines are assaulted from every possible angle by tropical bugs, nematodes and even birds which have taken a fancy to the sweet grapes; the transport infrastructure is another major headache with rough roads damaging the grapes; the company also believes that the tax regime which it faces is unfair and discriminates against locally produced wine.. But perhaps the biggest hurdle is convincing people to drink the wine. “At wine tastings when we asked people which was the better wine, ours or foreign wines, in most cases they chose ours,” Kagya said “but when we tell them they have chosen a Tanganyika wine they just can’t believe it and are less impressed which is very disheartening.” Kagya also faces problems in selling his wine to tourist hotels in Dar es Salaam. THE TIMES reported on March 28 that Tanzania’s army had destroyed almost 10,000 anti-personnel mines as it sought to adhere to the terms of an international treaty banning such weapons. The remainder of the stockpile of nearly 24,000 mines is to be destroyed in September 2004. Of the estimated 100 million mines deployed worldwide an estimated 30 million have been destroyed since a global ban came into force four years ago. (Thank you John Ainley for this item -Editor). The Daily News (3rd January) reported that the United Nations High Commissioner for Refugees had finally concluded the repatriation of over 23,000 Rwandan refugees from camps in Ngara district in Kagera Region. BA introduced thrice weekly non -stop flights between Dar es Salaam and Heathrow on 3rd April. By eliminating the transit stop in Nairobi, the flight time between Dar and Heathrow has been cut by two hours. BA stated that the changes had been made in response to the growing importance of Tanzania as a business and holiday destination. The Guardian (January 22) reported that nine East African black rhinos had been trans-located from South Africa’s Addo Elephant National Park to Mkomazi’s highly secured, electrified and heavily guarded, rhino sanctuary. 700 people attended celebrations marking the opening of the new American embassy complex in Dar es Salaam on March 4. The complex occupies 15 acres of land on the old Bagamoyo Road in Msasani. The previous embassy was destroyed by terrorists in August 1998. ‘World family’, the magazine of ‘Plan UK’ (Spring 2003) told the story of the six-year-old Tanzanian boy who featured in Jack Nicholson’s latest film ‘About Schmidt’. The film tells the story of Warren Schmidt, a retired and recently widowed man, who feels he has achieved nothing in life but is given considerable cause for soul searching when he sponsors a child known to him as ‘Ndugu’. The film’s director was keen to use a real child and the one chosen, whose name is Abdullah Mtulu, is said to be a talkative, smiley boy who lives near Morogoro and likes singing. Schmitz’s long letters, quoted in the film, were said not to reflect the reality of correspondence normally sent between sponsors and their sponsored children. Communities around Tanzania are expected to benefit from the film which has been nominated for several awards. The Guardian has reported that construction of an Mtepe, a now extinct type of dhow, is about to be started outside the House of Wonders in Zanzibar. What makes Mtepe special is that it is tied or sewn together with coir rope, as distinct from contemporary dhow’s which are kept together with iron nails. Construction is to be part of Denmark’s support for culture in Zanzibar. The Zanzibar Government has decided that the House of Wonders will be turned into a National Museum for History and Culture.